“What time table should I follow to prepare for GATE 2019 ? How to manage time for GATE 2019 exam preparation ? Before starting this article, I would like to tell you something. Many of you candidates will not agree with this strict time table. Le me give you some fact about GATE qualifying record. Nearly 8 Lakh candidates fight GATE exam every year. Only 15% (nearly) candidate qualify GATE. GATE qualifying Cut-off is just 25/100 (nearly). Now you calculate how hard you need to prepare for IITs or PSUs ? 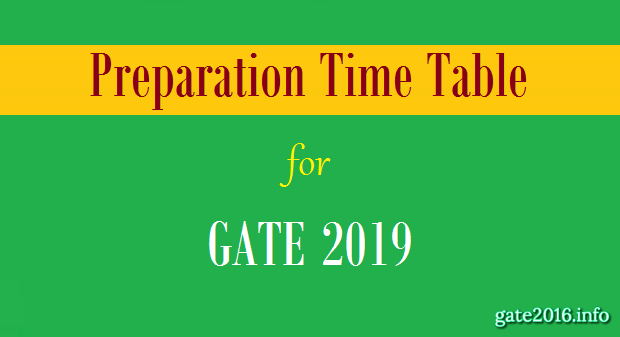 Preparation Time Table for GATE 2019 – GATE (Graduate aptitude test in engineering) is an exam which require high concentration, determination & hard work continuously. It is a national level exam so competition is high, obviously it requires a candidate to work hard throughout the whole year. There are many candidates who can’t join coaching for GATE exam preparation due to any sort of reason. Such candidates need a proper pathway to prepare this exam self. Actually a preparation time table is a must one who is preparing for any competitive exam. … and many more such comments are there. Must Read : How to Prepare for GATE 2019 ? In the series of GATE Guidance we are here through this article providing preparation time table for GATE 2019. This post is little bit lengthy but we tried to make it better, keeping in mind that this can help GATE 2019 aspirants fruitfully. Let’s start this guidance with basic information about GATE 2019 exam which every GATE 2019 aspirants must have. This is a common preparation time table for Mechanical Engineering (ME), Electrical Engineering (EE), Electrical & Electronics Engineering (EEE), Electronics & Communication Engineering (ECE), Instrumentation & Control Engineering (ICE), Computer Science Engineering (CSE), Information Technology (IT), Civil Engineering (CE) & all sort of engineering candidates who are preparing for GATE 2019. A candidate need to attend all sections either it is three section for paper codes – AE, AG, BT, CE, CH, CS, EC, EE, IN, ME, MN, MT, PI, TF and XE or two sections for paper codes – AR, CY, EY, GG, MA, PH and XL. Generally GATE exam syllabus of almost all branches contain 8-9 subjects which are related to their branch. Mathematics & General Aptitude are also included in this GATE syllabus apart from branch related subjects. We have defined about percentage of all these section using table – 1 & 2. Let us take an example of Electronics & Communication Engineering. One of the most competitive branch of engineering in GATE exam. From the above analysis candidates can easily understand the importance of Mathematics & General Aptitude in GATE paper. These 2 subjects are almost equal to 4 technical subjects. From the above analysis candidates must have understand the plan of GATE 2019 exam very well. Now let’s talk about GATE 2019 exam preparation plan. Here we consider that a candidate have almost 9 months for GATE 2019 exam preparation. Here we dedicated May month (1 month whole) for Learning basics of all subjects. 3 days for each subject, in this way a candidate can complete basics of all 10 subjects of GATE with in a month approximately. 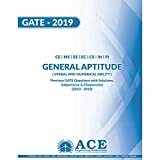 Although GATE exam is known for numerical problems mainly but without understanding the topic you can not remember much for long period about that topic. So here you have to understand every topic of GATE syllabus in precise manner. Now next 5 months from June to October are dedicated to your subject preparation related to your branch. As we always said you must solve previous years GATE papers of 20-30 years it will give you a good idea about questions which asked in GATE exam. These question will tell you what kind of questions generally asked and from which area of syllabus of a particular subject generally questions designed in GATE exam. After these 6 months we dedicated 3 months for revision and attending test series because revision will make your knowledge strong and test series will sharpen your knowledge according to GATE exam pattern. Out of these 3 months, for 2 months a candidate need to attend subjectwise test series. It will tell you about the subject in which you are strong and in which you are weak. So that you prepare them well in this remaining months. We dedicated 1 month for attending test series which contain all subjects in a single paper same as GATE exam. Now come to the month wise preparation plan. We considered here a month have 30 days and we divided these 30 days in 15-15 days slot. First 15 days are for subject -1 and next 15 days for subject -2. You can choose subject as per your interest. Remember you have to complete you whole GATE syllabus if you really want to get good marks in GATE. So we are here suggesting you to choose one easy and one hard subject. It will help you to cover your whole GATE syllabus and also it will help you prepare your weak subjects well. First 15 days plan : Out of these 15 days, first 5 days you prepare 5 chapters of any of your interest same in alternating manner like one easy and one hard chapter. For this you must have complete knowledge about GATE syllabus and every topic which is defined in the GATE syllabus of your subject. This is the main reason why we starting this article with GATE 2019 Paper pattern & Syllabus information. After these 5 days we dedicated 1 day for revision of all these 5 chapters. Next 5 days are dedicated for next 5 Chapters from days 7 to 11. On day 12 one more revision of chapter 6 to 10. Once you completed all these 1 more day is dedicate for revise of all 10 chapters of subject 1. After these 13 days of study we dedicated a day for Previous years GATE papers solving and Old test series of any coaching institute if you have. After this continues study plan of 14 days we have dedicated one day for rest completely. You can use this day as you wish but remember don’t do anything like which affect you next day study. Candidates need to follow the same plan for subject-2 of the same month. This plan will continuously followed by a candidate for next 5 months. In this way he/she would be able to complete all 10 subjects of GATE 2019 syllabus. You all must have thinking that why this much study ? First this plan is specially designed for candidates who are starting their GATE 2019 exam preparation from zero. Second if you think still this preparation plan of GATE 2019 exam is hard then you must check candidate qualifying record of previous GATE exams. Now come to day wise preparation plan. We designed this plan considering that a candidate have 11 hours for study out of 24 hours. Which I think is not very hard for a candidate who is preparing for GATE exam. Out of these 11 hours we dedicated 10 hours for 10 important topics of a single chapter of a single subject and remaining 1 hour for revision what you have studied in this day. In this time table candidates can take small breaks as per their requirements. 1. How much time you can dedicate for the preparation per day ? 2. How much time you can dedicate for the preparation per month ? 3. How much time you can dedicate for the preparation totally ? 4. In how many subjects you are strong ? 5. In how many subjects you are weak ? 6. How many subjects you need to prepare ? 7. How much time each subject will take to finish ? 1. Study all the subjects. Don’t leave any subject. 2. Make a habit to make short notes as per your requirement. 2. Don’t keep the time table fully packed. 3. Always keep buffer days as per your requirements. 4. Make sure that you revise every subject atleast twice before the exam. 5. Keep last one month for practising previous GATE papers. You all must have thinking that why this much hours we have to read daily continuously till several months ? As per GATE exam analysis only 15-16% candidates are able to clear GATE qualifying cut-off which is just 20-30 marks out of 100 marks. Now I hope you are clear about our vision of making this tight and long lasting study plan. If you have prepared many subjects during your graduation period then you can reduce your preparation hours as well as months. This schedule is specially designed for those who are starting their preparation from start and not joining any coaching institute for their GATE 2019 exam preparation. If you still think that we can add more details in this article which will help GATE 2019 aspirants to make their preparation plan better. You are always welcome for providing suggestions. ♣ Is it necessary to join coaching for GATE 2019 ? hello sir , i need any tips regarding gate preparation in 4 months , and i intend to crack with a rank below 1000 . please reply with any blog link of suggest something. please don’t tell me it is impossible sir, i don’t want to hear that answer. i can do anything that you suggest which is achievable . First I would like to appreciate your passion towards GATE exam and your eagerness for clearing this exam. For important subjects and topics buy a previous years papers book in which you will find all the analysis very well including GATE 2017 paper. From here if you regularly study till your GATE 2018 exam you will surely get good marks in exam. 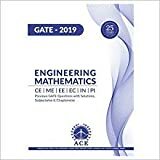 i am going to prepare for gate 2018 and i am from ece branch please suggest timetable or technique to study for gate 2018 as i am going for self study option. Hello sir.. I am from instrumentation and control engineering and currently in my 6th semester.I want to appear in GATE 2018.I have almost all the books that you have recommended for preparation. From may to July I have training so can you please help me that what technique I should prefer for GATE exam.Thankyou. You can easily maintain study of 2 hours in the morning session and 2 hours in the evening session. evening session : 6-8 pm. 4 hour regular study would be good in these 3 months. hello sir , i’m 3rd year student from ece department i want start my gate preparation from home . And the suggestions and time table which was given in this website very useful and please help me in getting a clarity on the books too sir. Yes Arihant publication book is good. Yes Made Easy Institute Test Series for GATE exam is good. Sir i want complete package of books for preparing gate 2017 including previous year questions paper with best publisher Perfect guidance. First, You please tell us your branch of engineering. After that we can help you properly. i dont if they are sufficient..
should i go for nptel lectures online ? please help me sir with proper guidance..
Thankyouuuuu soo much sir for your kind guidance. First know your mistakes from last attempt and try to resolve them as soon as possible. Standard books are must, other books are also acceptable but the study material provided in those books must be correct. Find the areas from which mostly question asked. Prepare them good enough that any kind of question you can solve. This time study topic wise like what question have been asked in GATE from Flip-Flop (for example) topic of Digital Electronics subject. Store all the questions at one place and analyse them what kind of questions they asked from this topic, what is their difficulty level. In this way you will get good idea about what topics are more important and what less. Nowadays there are many institute which provide topic wise solved papers of GATE. In this competitive environment you need to know what to read but you have to know what not to read. Is solving previous years papers and problems from Kanodia books enough for getting a top 100 rank in GATE EC 2017? I am currently enrolled in one test series(full package) and thinking of joining two more only for the full length tests later in the year. Will it be enough? Some advice in these regards is highly appreciated from my side. If you believe in your study techniques and can do work hard then you can easily achieve your goal in GATE exam. Kanodia books are good but they are only guide books if just by solving Kanodia books you can get rank in GATE under 100 then everyone will read only those books. Text books + Reference books + Test Series will make your GATE exam preparation better. Join Test series for GATE as much as you can but attend them with full attention and with full preparation otherwise they are not more than wasting time. (1) You have almost 8 moths to prepare for GATE. You can refer standard books for your preparation. Invest 1-2 days for basic of each subject preparation. Do not invest too much time on a single topic or chapter. Set a time limit for everything n set target for a day. (2) Buy a chapter wise previous years papers book of last 15-20 years and start solving them from chapter 1 to last. Solve similar kind of problems from reference books and if you find difficulty in understanding any topic you can refer reference books now. (3) Notes means the most important point or formula from exam point of view. Note only those in your note book. One chapter note should completed within a page of notebook, in this way you would have a 10 page note of a subject which contain 10 chapters. You can minimise them later while revising them. Consider you minimize them in 4-5 pages of each subject, if there are 10 subject in your GATE syllabus then you need to revise those 40-50 pages only a day before GATE exam. hi, I am SRI KANTH.M of mechanical branch i need a perfect time table up to gate exam pls provide me. Modify it as per your requirement and as per your knowledge. No one in this world can make a perfect time table for a person because it depends upon many factors. We hope you understand. I have given 4 sem exam ..I’m a average student from ece trade.what kind of time table should I apply to get two digits rank ..I will give exam on 2018 .. I am Going to start preparing for GATE 2017. Only 6 months are left so I am confused between going to a coaching center for Studies or preparing by Self Study and giving the Mock Test in any good institute. Going to a coaching center would basically mean no self study on Sat and Sun and obviously is costly as well. So any help to clear my confusion would be really appreciated. Here you need to think what you want to do ? What pattern of preparation will suit you ? Both technique of preparation have advantages as well as disadvantage. You need to note down pros and cons of both techniques in respect you and then decide which one will beneficial for you. We have written some posts where we have described such situation extensively. Please read them first still you have any problem, we are here to help you.